Once a year we celebrate what some call “The Feast of Fools.” It began as an ancient pre Christian ritual, and remained popular in many forms right through the Middle Ages. Join us in an upside-down world where revelers wake up the sun with noisy celebrations, sometimes even raucous ones. All the fun has a serious message, though, in which light overcomes dark and good vanquishes evil. 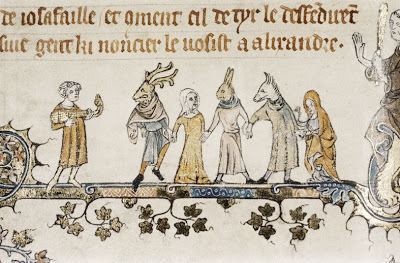 There are dancers with bells, swords and sticks, mummers, tricksters and always a fool to re-enact an ancient ritual of Midwinter where, on the longest night, the revelers stay awake through the night to call forth the sun from the womb of night. As always there will be the traditions – the Mummer’s Play, the Morris and Sword dancers, the Choir and the Lord of the Dance leading us all in the dance. And, as always, there will be a few surprises! Bring the family. Bring the neighbors. Help us bring back the sun! This Revelry will pause for a few minutes for an Offering to be shared with the Sudbury Food Pantry which is run completely by volunteers who have distributed more than 1000 meals this year to people in Sudbury and twelve other MetroWest towns who need it. As a result of current economic conditions, the need for its services is more urgent than ever. lease give generously to your hungry neighbors.